Decades of neuroscience research show that learners must rely on working memory to effectively consume and assimilate new information; unfortunately, it has also proved that working memory has a limited capacity. This creates a ‘‘bottleneck’’ for learning that limits how much and how quickly information can be transferred into long-term memory. Cognitive limitations such as these have a very real impact on learning, especially in medical education and healthcare training where clinician learners are often presented with large amounts of critical information. The Learning Actions Model was developed to overcome this limitation and arm the educational community with a structured framework that makes it easier to teach and learn. Since cognitive science shows that a learner must move the right information out of working memory and into long-term memory before it is forgotten or overwritten, the Learning Actions Model enables learners to consume information more efficiently and ensure that critical information persists over time until it is fully connected to and integrated into a learner’s long-term memory. Cognitive science shows that working memory and long-term memory play a critical role in one’s ability to learn. In fact, learning is critically dependent on an individual’s ability to consume and assimilate new information into working memory and to then efficiently move the right elements of working memory into lasting, long-term memory. Unfortunately, working memory has a limited capacity – this constraint creates a ‘‘bottleneck’’ for learning and limits the speed at which information is processed to long-term memory (LTM). This limitation has a very real impact on learning. It means that a learner must move the right information out of their working memory and into long-term memory before it is forgotten or replaced by new information. In a digital age where new information is constantly pushed and pulled from multiple directions, often simultaneously, educators and learners struggle to overcome this learning bottleneck. We now understand that there are three forms of ‘load’ that impact working memory: intrinsic (complexity of content to learners), extraneous (environmental distractions or learning action barriers) and germane (effort invested in cognitive strategies of learning, i.e. schemata construction). When the three forms of cognitive load associated with a learning experience exceed the learner’s working memory capacity, performance and learning is impaired. Therefore, to facilitate learning, educators MUST work to minimize extraneous load, titrate intrinsic load to the developmental stage of the learner (e.g. simplify content without decontextualizing) and allow learners to reserve cognitive capacity for the germane load (learning automation and schema formation). With this perspective it might be easier to see effective teaching as largely, if not entirely, dependent on one’s ability to construct learning experiences that increase the capacity of working memory and/or enhance a learner’s ability to more efficiently process the right information into creating long-term memories. 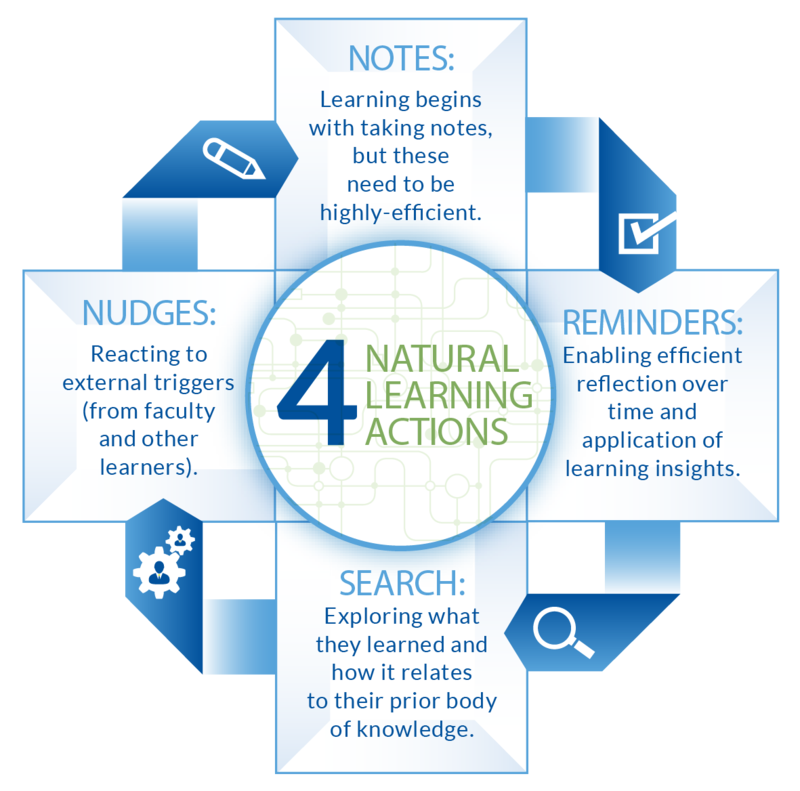 Early field research by the ArcheMedX team, as highlighted in this graphic, identified four natural learning actions (taking notes, setting reminders, searching for related information, and responding to external nudges) that learners rely on in an attempt to effectively consume information and overcome the limitations of working memory. However, this research discovered that because clinicians have historically relied on their own makeshift approaches to take these actions they end up creating additional barriers to learning, not fewer. The reality is that these learning actions need to be integrated into the overall learning experience to simplify the process of learning. Clinicians require a more structured and connected learning experience to more easily identify critical lessons and apply them to practice. Enter the Learning Actions Model! 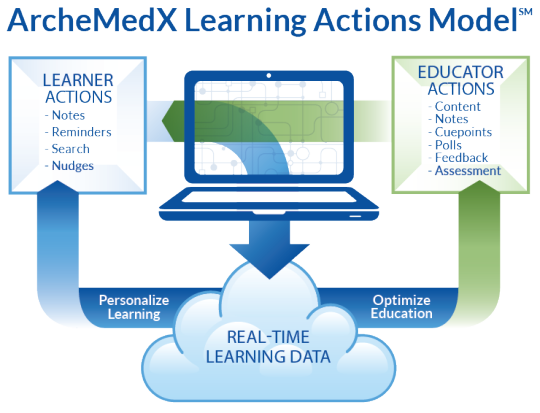 Based on the natural learning actions research, the ArcheMedX team developed the Learning Actions Model to provide the structure clinicians require to simplify their online learning and improve performance in practice while enabling educators to harness real-time learning actions data to optimize educational content and continuously improve their educational interventions. As this graphic depicts, the key to this approach is re-engineering both the learner’s experience and the educator’s ability to construct, evaluate, and refine the education in such a way that both are optimized over time. As learners take more personalized and structured actions in the learning environment, educators learn more about the effectiveness of their programs. This creates a real-time loop of learning actions and data analysis that allows educators to know how and when to nudge learners in the right direction and to continuously improve the learning experience. By supporting critical new innovations in learning and educational planning provided by the Learning Actions Model in an Intelligent Learning Platform, ArcheMedX enables educators to increase the capacity of learning within a simpler and more engaging experience for clinician learners. And through ArcheMedX the positive impact of the Learning Actions Model has been validated time and time again as tens of thousands of learners have improved their knowledge, competence, and confidence as they have participated in hundreds of online learning activities across dozens of clinical areas. Explore the Learning Actions Model in greater depth with the ArcheMedX team and identify ways to apply the Learning Actions Model to improve your learning outcomes.